Fourth Row Center: Film Writings by Jason Bailey: In Theaters: "The Grey"
There’s a stillness at the center of Liam Neeson which goes a long way to explain his unexpected yet delightful cinematic second act as an action hero. He’s not the first actor to mine the “reluctant man of action” groove, but he’s one of the few that actually makes you believe him; he projects a sense of a life lived before the camera rolled, of experiences and knowledge accumulated that he’d rather not call upon, but fine, if he must, he must. He’s present on the screen—“in the moment,” as they say in all of those beginning acting classes, and he’s not waiting for the opportunity to knock someone out or stage a daring escape. He does it if he has to, and he gets on with it. He does not kill himself. Instead, Ottoway (Neeson) gets on a plane with his fellow rougnecks to fly home, back to Anchorage. Alas, the plane crashes in a scene of nerve-jangling intensity; Carnahan is back to the up-close, improvised aesthetic of his best previous film, Narc (eschewing the slickness of the pictures that followed it), and the terror of the sequence is mostly due to its intimacy. He spares us the bad CGI wide shots and stays in close on Neeson, which is wise, since that’s who we care about anyway. Only a handful of the men survive the crash, and they haven’t even devised a plan for surviving the subzero tundra before realizing they’ve landed in the hunting zone of a pack of giant, wild wolves. Ottoway worked as a sharpshooter back at the refinery, so he knows about their patterns and quickly undertakes a leadership role, with some resistance (the conflict is necessary, one supposes, for dramatic purposes, though these scenes are the most pro-forma and uninspired of the picture). And that’s the film: Ottoway and a dwindling handful of survivors, trudging through the snow and trying to stay alive as the haunted sound of howling wolves surrounds them. It sounds, at first, like a second-rate knockoff of Mamet’s The Edge, particularly with the early scenes of macho chest-pounding (which Neeson’s character quickly diffuses: “What’s wrong with being scared?”). What’s new is the tempo. Carnahan, a director of wildly unpredictable quality (I’m still not sure how you go from the brilliance of Narc to the comic book silliness of Smokin’ Aces and The A-Team), is relentless, and he barely gives his audience a chance to breathe between his audacious and scary set pieces—all the while avoiding the kind of monotony that cripples lesser filmmakers. The violence, when it comes, is fast, punchy, terse. The wolves come out of nowhere, but Carnhan never stoops to cheap scares; he respects his audience too much. The thrills are earned, and though he seldom lets up, we never feel we’re being abused—even in the film’s most harrowing sequence, a free-fall and high-strung cliff-to-tree crossing that helps you fully understand what the phrase “heart in your throat” means. (Between this and Mission: Impossible—Ghost Protocol, it’s a tough couple of months for those of us with vertigo.) 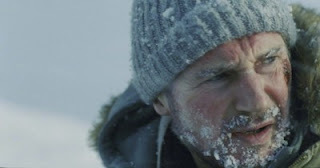 It’s a bracing picture, but when he stops to take a breath, he makes a good, full, deep one; a campfire scene not only shades in the details of the rather stock characters (the entire supporting cast is unassumingly great), but gives Neeson a powerful speech about the things “that make you want the next minute more than the last,” the things that are, for lack of a less worn phrase, worth fighting for. The Grey has depths and weight that are unexpected, from the bravura scene early on where Neeson guides a dying man into the darkness to its unexpected turn towards existentialism near its gutty ending. “Show me something real! I need it now!” Ottoway exclaims to the heavens, before sneering, “fuggit, I’ll do it myself.” That’s Liam Neeson, action hero, in a nutshell. The Grey is a gripping and raw thriller, and its release into the dumping ground of January means that either execs are hoping to replicate the unanticipated success of Neeson’s Taken a couple of winters back, or that they don’t trust audiences to embrace its uncommon fusion of gruff action and character drama. Here’s hoping they’re wrong about the latter, and right about the former. "The Grey" opens tomorrow in wide release.